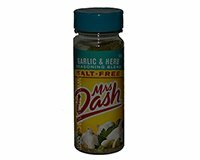 Mrs Dash® Garlic & Herb Seasoning Blend is an all natural, salt-free, fat free blend of savory garlic and 14 herbs and spices adds great flavor to all of your favorite foods, including meats, vegetables, sauces, pasta, poultry, soups, and salads. Add a cap-full of Mrs. Dash to jarred pasta sauce or use it to top your favorite pizza to wake up the flavor. Ingredients: Garlic, Onion, Spices (Black Pepper, Parsley, Fennel, Basil, Bay, Majoram, Oregano, Savory, Thyme, Cayenne Peper, Coriander, Cumin, Mustard, Rosemary, Celery Seed), Carrot, Orange Peel, Spice Extractives. Zesty Orange Vinaigrette More Recipes..